These are the places we keep coming back to. 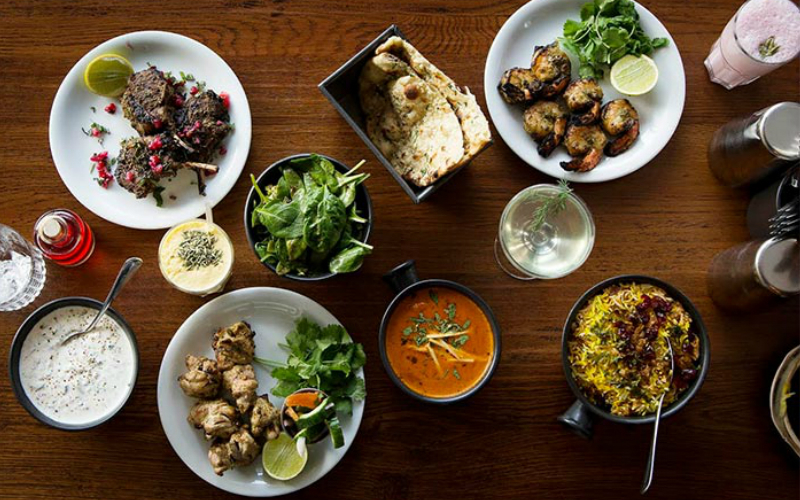 The best restaurant chains in London. We can’t always eat in the latest impossible-to-get-into seven-seater restaurants, so it’s the lovable chains in this city that keep us well fed time and time again. The original Hawksmoor in Spitalfields has been around for 10 years now and they’ve since expanded to have six sites in the UK and an upcoming opening in New York. They’re all about the steak of course and if you’re looking to splash out on beef, there’s really no better place to do it. Alongside the steaks are all sorts of other goodies including beef dripping fries, lobster mac & cheese and THOSE ‘Rolos’ for dessert. You’re never more than 100 metres from a Pret in London so it’s no wonder that we all have a (secret) love affair with the place. 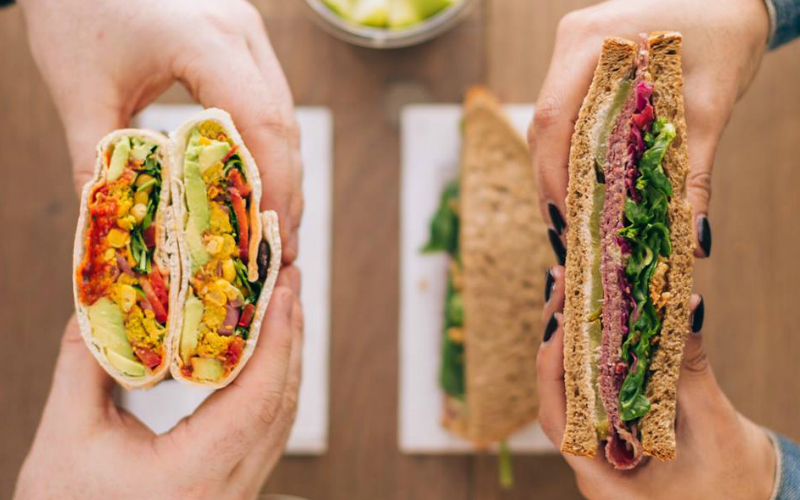 Whether you’re stuffing in a hangover-busting ham and cheese croissant on the way to work or having the BLT for lunch AGAIN, it’s quick, fresh, and reliable every time. Plus you’ve got to love the fact they give away leftover food to the homeless, give you a 50p discount on coffee for bringing your own cup, and encourage us to eat our greens with their veggie only stores. Dishoom sure knows how to do it. All their sites have regular huge queues out the door and it’s not hard to see why. They do Indian food like no other and their bacon and egg naan rolls for breakfast are the stuff of legend. Absolute joy every time. 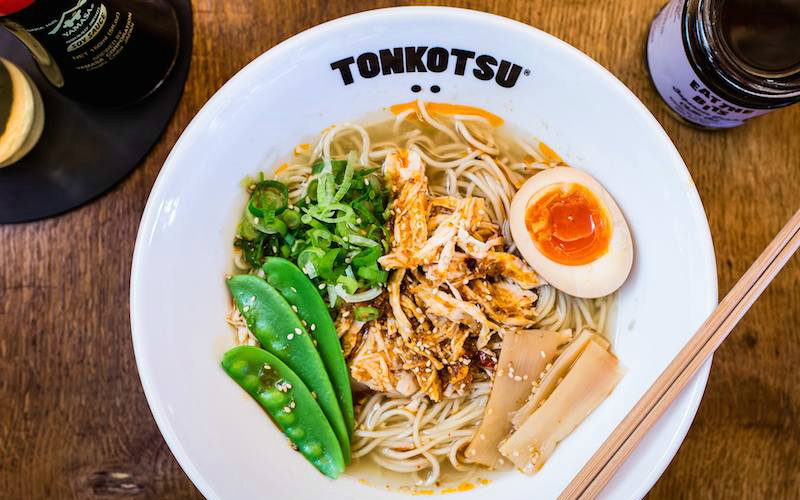 Tonkotsu is the best of the ramen wave that swept London back in 2013 and testament to that, they’re still going strong and opening new sites all the time. The signature Tonkotsu ramen, with its thick creamy broth, fresh noodles (made in house), and slices of pork is a thing of beauty and has got us through many a day and night. One to come back to time and time again. 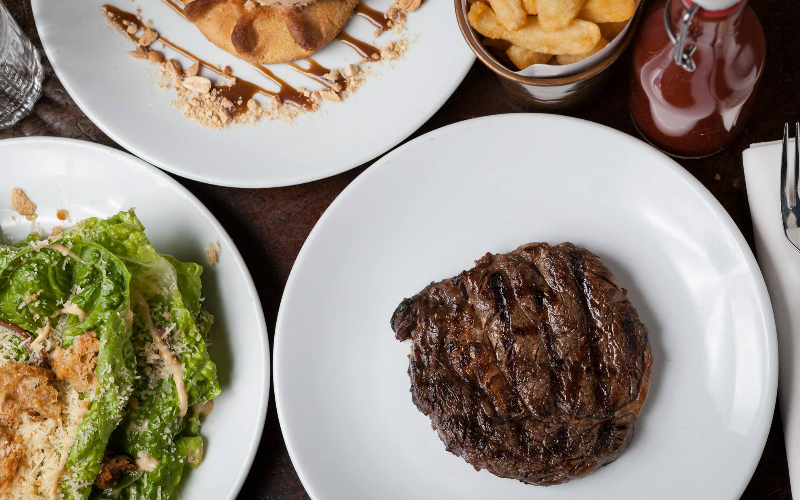 The original Hawksmoor in Spitalfields has been around for 10 years now and they’ve since expanded to have six sites in the UK and an upcoming opening in New York – not bad! They’re all about the steak of course and if you’re looking to splash out on beef, there’s really no better place to do it. Alongside the steaks are all sorts of other goodies including beef dripping fries, lobster mac & cheese and THOSE ‘Rolos’ for dessert. Dishoom sure knows how to do it. All their sites have regular huge queues out the door and it’s not hard to see why. They do Indian food like no other and their bacon and egg naan rolls for breakfast are the stuff of legend. This branch, housed in a old transit shed with nice decorative touches that nod to the railway as well as a basement cocktail bar, also looks amazing too. Absolute joy every time. 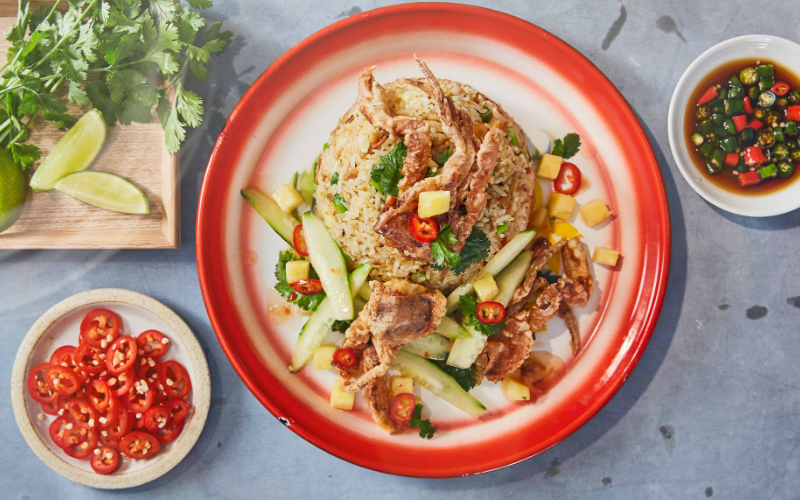 Like Wagamama’s cooler older brother, Busaba did for Thai food what Wagamama did for Japanese. Still a reliable choice for a quick dinner, we’ll never turn our nose up at their Pad Thai or Mussaman Duck Curry. Considering these guys were selling pizzas to a lunchtime crowd from a tiny van in Soho just a few years ago, Pizza Pilgrims’ quick expansion has been impressive. 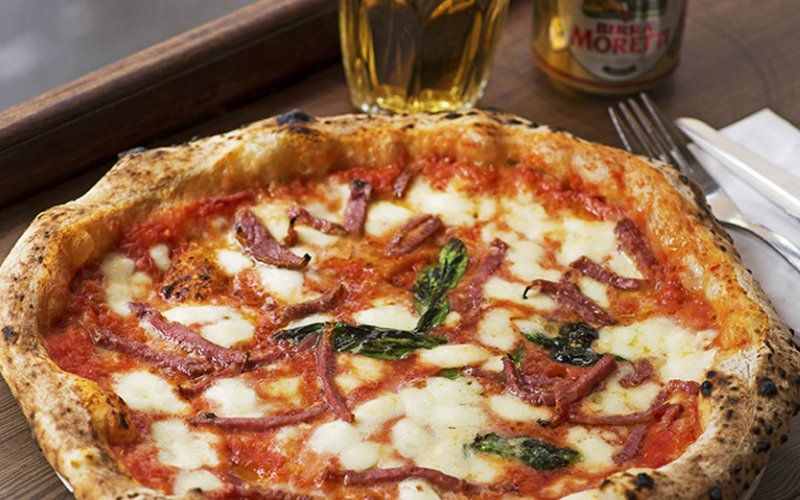 Their Neopolitan pizzas are pure satisfaction with simple generous toppings and soft doughy crusts. And anywhere that does a Nutella dough ring for dessert is alright by us. 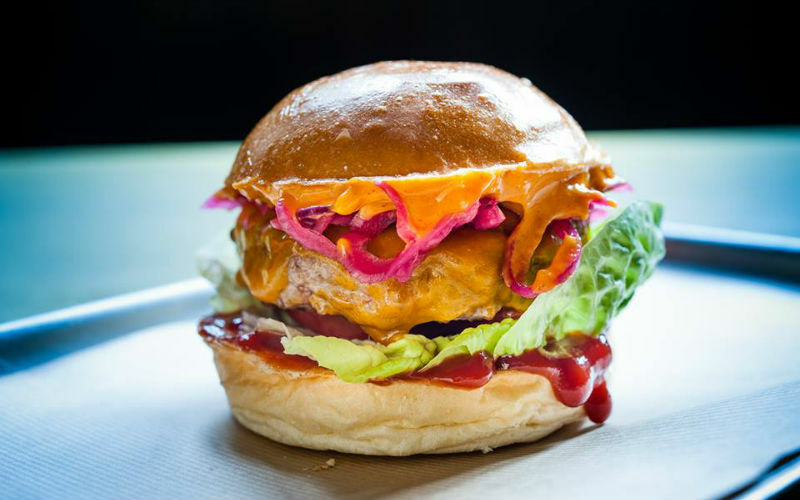 Our entry for posh burger goes to Patty & Bun who’ve taken London by storm since launching a few years ago. It’s the Ari Gold what won it, a thick meaty patty covered in oozy cheese, topped with pink pickled onions and sandwiched in a toasted brioche bun. There’s all sorts of regular specials and an epic breakfast menu at some locations too. A winner every time. 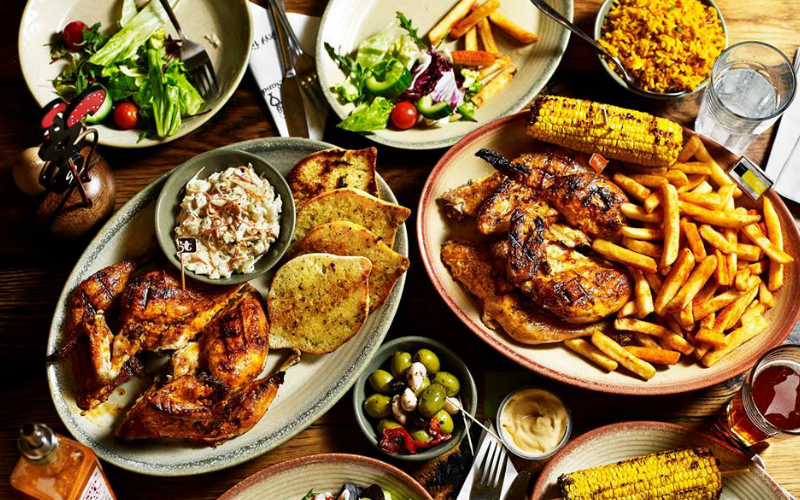 Where else can you go for office leaving lunches that keeps everyone as happy as Nando’s? Well, maybe Pizza Express but most people got bored of that back in the 90s. Sure, chicken is never the most exciting thing you can eat but when it’s doused in all those spicy sauces, who can really argue? And when there’s peri peri chips dunked in perinaise and arguably the best coleslaw in town, it means everyone always leaves at least a little bit happy. When Alan Yau founded Wagamama back in 1992 it was a bit of a game changer, with its cool minimal design and strange exotic dishes. Now we all know our soba from our udon and even though you can find it all over the place, from shopping centres to airports, it still dishes up reliably tasty Japanese grub in super quick time. 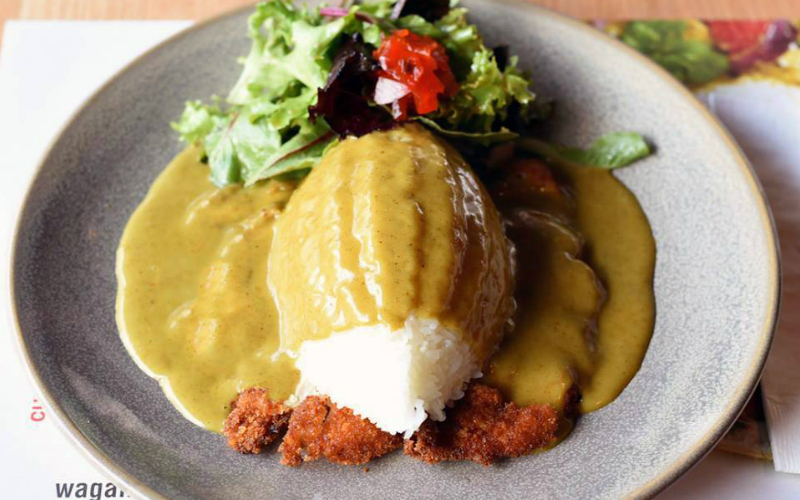 From chicken katsu curry to firecracker prawns, Wagamama should have a place in every Londoner’s heart. 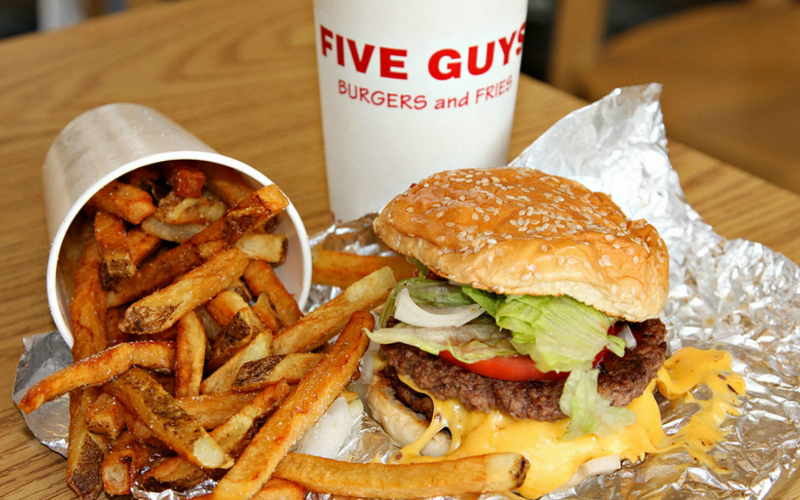 They may not have the most refined burger in town but when it comes to that all-satisfying middle ground between Maccy Ds and ‘posh’ burgers, Five Guys reigns supreme (sorry Shake Shack, it’s true). The burgers are big and filthy, you can choose as many toppings as you want, and they have those swishy Coke machines with endless soft drink choices. Plus, who doesn’t love their kitsch bit of retro American diner style? Definition of a guilty pleasure and one we indulge in maybe a little too often. Pho went from one to many in just a couple of years and now they’re all over. 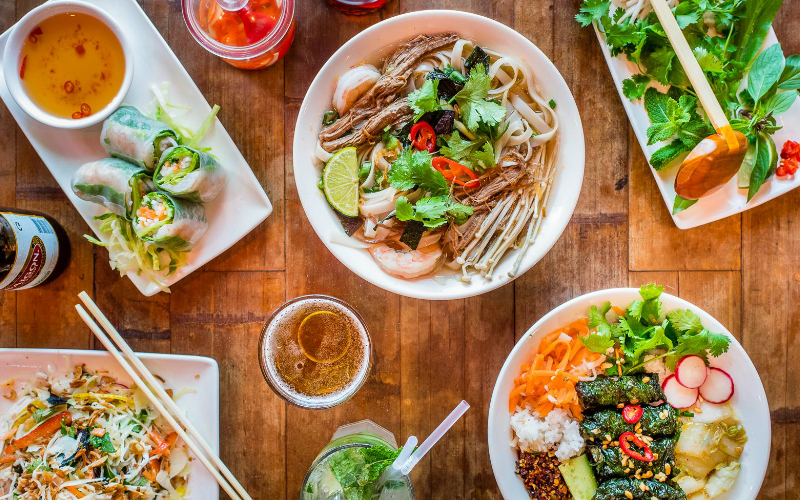 We’re a big fan of the Vietnamese chain for their fast, healthy menu and interesting specials that they don’t change too often – because let’s face it when you’re going to a chain you know what you want to order. On the Pho menu we’re fans of the Bun Cha with nem nuong pork balls and spicy sauce and no matter how many times we go and think we’ll try a new dish, we never do. The good news it never disappoints.